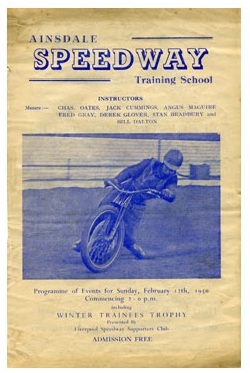 Ainsdale speedway team were based on Ainsdale Sands in Lancashire. They operated as a training track in the 1948-49 season and as an Open team from 1950-53. The programme shown below is one of their earliest as an Open Team. Colin Meredith first rode on Airndale Southport sands prior to racing for Belle Vue amongst other teams in the 1970's. The track had a length of 380 yards. It switched to being a Training track again from 1954 to 1958 before one more Open season in 1959. Not surprisingly, the team was nicknamed 'The Gulls'.